Overwatch Uprising Event Returns in April | Nerd Much? Blizzard has begun teasing the next Overwatch event which looks to be headed our way in April. We don’t have much to go on, but thanks to it being a reoccurring event, we probably know about what to expect. Overwatch’s Facebook and Twitter accounts just released the above video today to tease the upcoming event. The developers don’t shed many details, but we do see that Blizzard references “File 00382 – King’s Row Uprising”. This is notable because the event that Overwatch hosted this time last year was known as Overwatch Uprising. It ran from April 11, 2017 to May 2, 2017. The lore-based portion of the event took place in a modified, damaged version of King’s Row. Occurring near the end of Overwatch as an organization, the goal was to defeat the Null Sector uprising that was taking place within the locale. Tracer, Torbjörn, Reinhardt, and Mercy were sent in by Commander Jack Morrison to fight the Null Sector omnics against the British Prime Minister’s orders. The event marked Tracer’s first official mission with the team. Together, they eventually overcame the Null Sector omnics thanks to a bomb they delivered to the Sector’s hideout. It’s possible that the 2018 Uprising event will mimic the one from 2017. It’s confirmed thanks to today’s Facebook and Twitter videos to take place in King’s Row once again. So there are already obvious core similarities. That event featured the above mentioned lore mission. But it also included a four player brawl co-op arcade mode too. It also included 114 unique Uprising items comprised of skins, emotes, victory poses, voice lines, sprays, highlight intros and player icons. 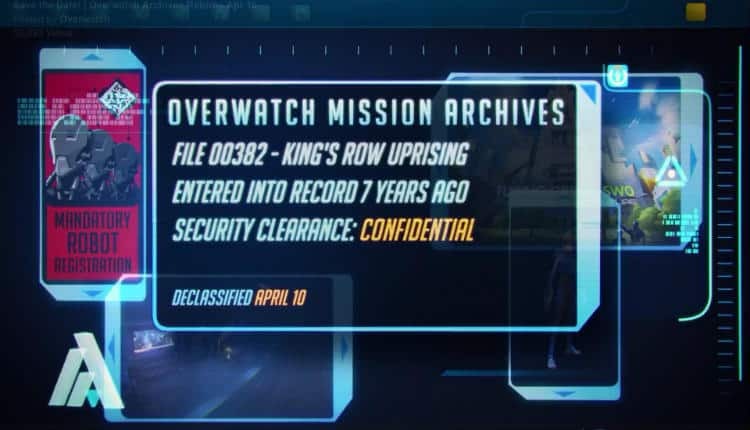 Blizzard’s video today teases that File 00382 – King’s Row Uprising will be declassified on April 10th. That’s likely the launch date for the next King’s Row Uprising event. So we’ll likely have details from Blizzard at some point next week.